Why do I need an elbow arthroscopy? 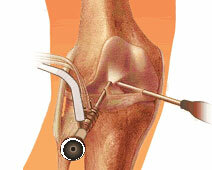 If you have had a history of ongoing pain and or locking in your elbow you may be a good candidate for arthroscopy. This procedure allows the surgeon to look inside your elbow joint and evaluate the surfaces and structures of the elbow joint and assess what is causing your symptoms. There can be many causes of pain and or locking in the elbow including loose bodies, arthritis and cartilage damage/tears. What are the risks of having an Elbow Arthroscopy?